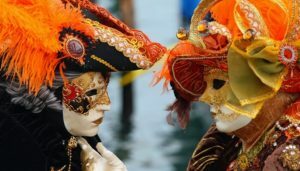 Traveltipy > Italy > Venice » Transport in Venice: how to get around in Venice? How does public transport work in Venice? Here is our complete guide to move easily in Venice using the city’s different transport options. Venice is an ideal city for walking, but even the most seasoned walkers will probably want to use public transport in Venice at some point. After all, in the absence of both cars and buses, transportation in Venice happens mostly on water, and you will not regret a trip on a vaporetto, one of the famous boats sailing daily across the city. To get around Venice, you must first get there – here is how to get from Marco Polo Airport to Venice. Are you coming from Treviso Airport? This way. The good news is that Venice’s public transport system is really simple and easy to use: there are very few transportation lines in Venice, and only a few places where you will have no choice but to take the boat. The bad news is that transport tickets seem more expensive than they should be, so it is important to be aware of all the transport options in Venice if you don’t want to end up spending too much money. How to use public transport in Venice? As you will have understood, boat rides are Venice’s main means of transportation and it’s what you’ll be using most of the time. There are different types of boats in Venice. 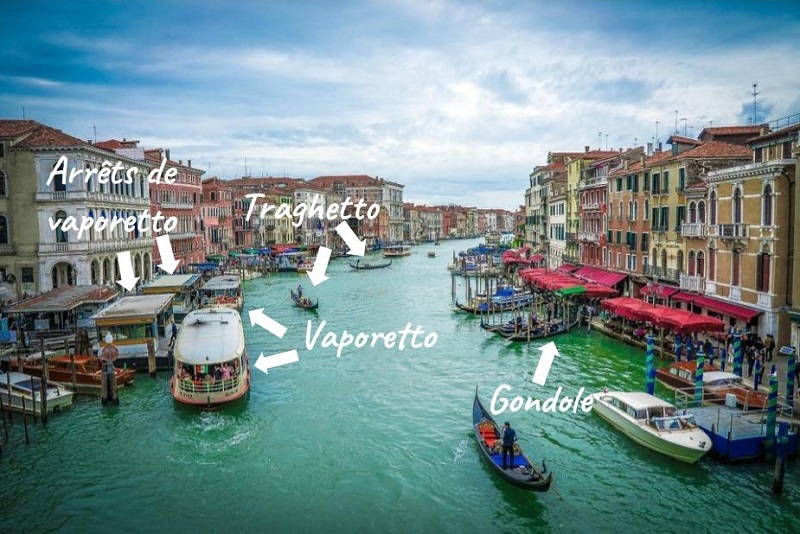 You have probably heard the terms vaporetto, gondolas, and traghetto – but do you know what they correspond to? Vaporetto – These are the large bus boats that run on regular lines (see map of lines) along the Grand Canal for example and from Venice to Murano and Burano. During your stay, you will at some point board a vaporetto (plural: vaporetti). Gondola – The image of a Venetian gondola is what first comes to mind when one thinks of Venice. You can rent a private gondola for a cruise but it costs a small fortune. 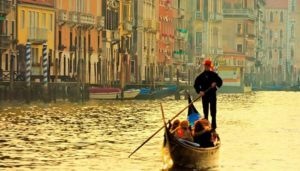 Learn more about gondola rides in Venice. Traghetto – They look like gondolas in every way, but they are only used to cross the Grand Canal in various places. There are traghetto stations along the Grand Canal and these boats regularly carry passengers from one shore to the other. The price of a crossing is €2 for non-residents. The gondoliers are not really gondoliers, they don’t sing, and do not wear striped shirts. Generally, passengers do not sit during the crossing. On this picture of the Grand Canal, you can see the three types of boats – among others. 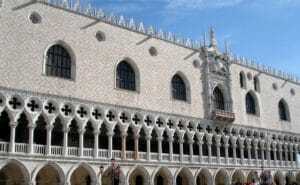 As mentioned above, most travellers simply walk around Venice for the duration of their stay. You can really walk anywhere and, in many ways, walking in the city is one of the things to do in Venice. But taking the boat along the Grand Canal (especially at night) can be a great way to have a good time. And if you plan to visit other islands in the lagoon, it is likely that you will take a vaporetto or two to Venice. Let’s be honest: getting lost in the narrow streets of Venice can be part of the charm of your stay. 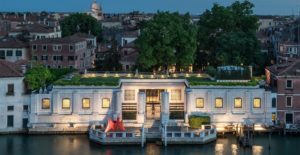 As the vaporetti only circulate along the Grand Canal and between the islands of the Venetian lagoon, you do not really have to worry about your trips across the network of lines. If you are staying close to the Grand Canal, it may be easier to get to the nearest vaporetto stop and check the stops served by that line. And if you are planning a trip to one of the other islands, you’ll simply need to find a connecting line. 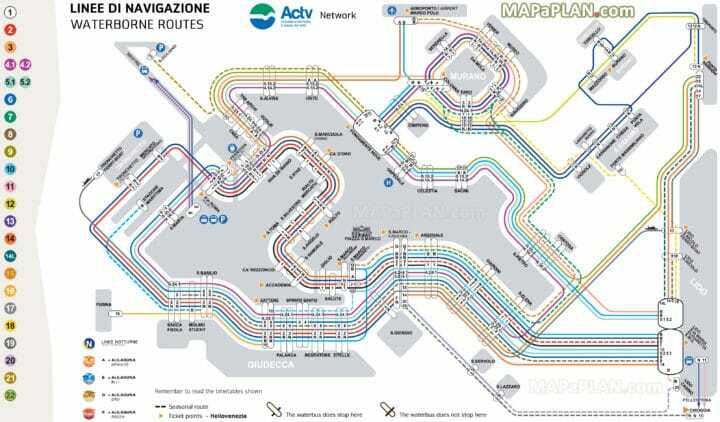 To help you familiarize yourself with how to get around in Venice, below is a map of the vaporetto lines in Venice. Vaporetto: where to buy your tickets, at what price, times…? A single vaporetto ticket, valid for 75 minutes, will cost you €7.50. If you’re simply wanting to cross a canal, it’s a high price to pay. 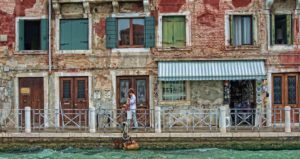 This is why we suggest you either take an ACTV Pass that gives you access to all transport in Venice for the duration of your choice (from 1 to 7 days), or take a traghetto, or walk. Children under 6 travel for free! Once you have purchased your ticket, do not forget to validate it in the machines available at each vaporetto station just before climbing into the vaporetto. ACTV Venice Pass: what are the advantages? Vènezia Unica is the main vendor of public transport tickets, and you can buy vaporetti tickets in the Vènezia Unica cabins found in most stations. Free schedules and maps are also available. Tickets can also be purchased in advance online. In fact, if you plan to use the vaporetto frequently (more than three trips), instead of spending €7.50 for each one-way ticket, it is advisable to take an ACTV Pass – which gives you unlimited access (and for a set period which starts when you validate your ticket at the yellow machine located at each vaporetto stop). Scan your card each time you board, even if you have already validated it during your first trip. If you are checked without a valid ticket, you will have to pay an immediate fine of €59 (plus the fare of €7.50). No exceptions made. Where to collect the ACTV Pass? To collect your ACTV Pass booked online, you must exchange the voucher you received by email at one of the Vènezia Unica offices or at a Vènezia Unica vending machine. Following your booking, you will receive the complete list of all vending machines by email. Simply scan the QR code on your voucher at the yellow vending machines. Your ticket will be issued automatically, allowing you to use any vaporetto for the chosen duration indicted on your pass (from 1 to 7 days). Transport in Venice: what is the main tourist vaporetto line? The main tourist vaporetto line, the one that is recommended if you want to “cruise” (without a guide and at lower cost) on the Grand Canal, is the vaporetto line #1. 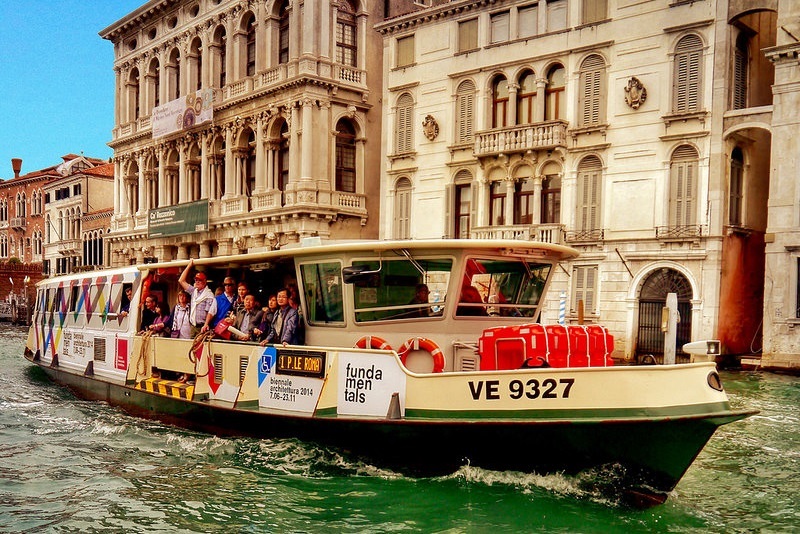 The vaporetto line #1 runs on the Grand Canal and stops at every stop between the station and Piazza San Marco. It takes between 45 minutes and an hour to travel between these two points. If the weather is good and if you are looking for a peaceful way to sightsee, this is a great way to relax for an hour. If you have any questions about transport in Venice, feel free to ask me in the comments area below this article.